Get off Telegram: London Summit is featuring seven unique panels, seminars, and workshops about crypto. This year has seen a growing emphasis on cryptocurrencies across the retail trading industry. With the price of Bitcoin hitting all time records by the day and making inroads into mainstream finance, it is little surprise that we decided to give cryptocurrency some times on the agenda. The Finance Magnates London Summit 2017 will be featuring a wide range of panels, seminars, and workshops detailing ICOs, cryptocurrencies, and blockchain technology. So there’s one for all crypto aficionados. Get off Telegram and see what we have in store for you. Tweet about the summit with its hashtag, #londonsummit17, and we’ll feature it in our posts! Attendees and prospective visitors are invited to familiarize themselves with the agenda in more detail by accessing the following link. Want more crypto? Take a look at the following seminars, workshops, and panels will be dedicated solely to this space. Focus: Traditionally this is a birds-eye view of industry trends. However, it is impossible to mention any future trajectory of the financial industry without cryptocurrencies and the specter of regulations in this field. How do industry leaders see crypto? What percentage does it make of their volumes, and what does the future hold? On November 15th you will find out. Speakers: Richard Olsen, CEO of Lykke; Yoni Assia, CEO of eToro; Matthew Miller, COO of Shift Forex; Rosario Ingargiola, CEO of OTCXN; Carolina May, Strategic Advisor to NewsBTC; Avner Ziv, CEO of ZotaPay; and Cryptocurrency Editor at Finance Magnates, Avi Mizrahi (moderator). Focus: As blockchain keeps making inroads into the heart of financial machinery, cryptocurrencies are becoming household names for retail investors. The panel will provide much needed clarity about the various applications of cryptocurrency for financial services, mixing a healthy dose of crypto-vision with down-to-earth solutions for products, security, and risk management. 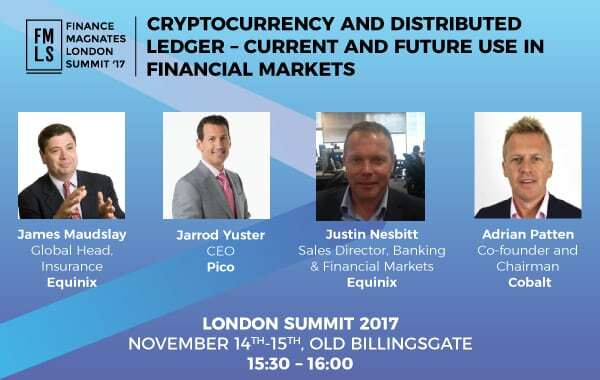 Speakers: James Maudslay, Global Head of Financial Services; Justin Nesbitt, Sales Director at Equinix; Jarrod Yuster, CEO of Pico; and Adrian Patten, Chairman at Cobalt. Focus: Blockchain technology has been the biggest driver of research and development in 2017, permeating the trading and banking space, among others. The moderated panel will include an introduction by Equinix as well as a short presentation from Cobalt. Focus: Everyone has read the headlines and news feeds littered with record breaking ICOs. However, are you cut out for an initial coin offering? The seminar will discuss the evolution the ICO space has undergone, explaining the adaptations required from industry participants eyeing an ICO in any field. Focus: ICOs are the new buzzword in the industry. With the use of blockchain technology and applications expanding into every segment of the financial services space, the time to discuss these trends and their respective impacts and funding mechanisms is now. 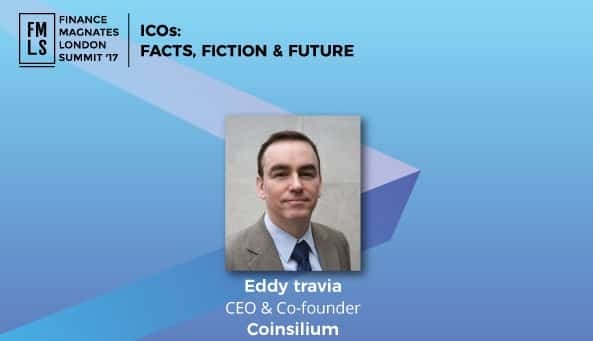 Travia will explore the multiple factors that have triggered the wave of ICOs in the last twelve months, the advantages and risks of this new funding method, and the outlook for the future. Focus: For a few years, the old and new online trading industries have existed side by side, for the most part ignorant of each other. Then, earlier this year, cryptocurrencies finally exploded into the mainstream. The workshop will be exploring the phenomena of cryptocurrency trading, looking specifically at the differences between crypto and CFD trading from the perspective of the end user. Focus: While everybody is talking crypto, actually acquiring a thorough understanding of the most crucial steps for a successful transition is not that obvious. The workshop will break down the shift you need to undergo to become a successful cryptocurrency broker. This includes an emphasis on technology to operations, ranging from conversion, to retention and legal aspects.